Director for the Timber Validation Department of the Forestry Commission, Mr. Chris Beeko, has made a recommendation for definition of legal cocoa in Ghana. According to him, this was a necessary first step to addressing the problem of deforestation caused by cocoa farming in the country. Cocoa is Ghana’s top cash crop commodity and also the main source of livelihood for majority of farmers. However, current research indicates that between 2000 and 2014 in Ghana, about 84,813 hectares of forest lands were destroyed inside protected areas and this has doubled within non-protected areas due to illegal farming of cocoa in forest areas. Speaking at the TFA2020 Side Event in Accra, Mr. Beeko noted that the lack of clarity on laws for production at the farm level could have implications for cocoa traceability and sourcing. He said there was the need for a multi-stakeholder deliberative process to define the rules for the cocoa sector. Legal cocoa became an issue of debate at the event because the concept is not known in the cocoa sector unlike in the timber sector where the concept of illegal timber has been established for many years. Participants through discussions highlighted the complicated local supply chain of cocoa which makes determining source of cocoa a problem. There was, however, consensus on the need to end sourcing of cocoa from protected areas and forest reserves. Also speaking at the event, Co-ordinator of Forest Watch Ghana, Mr. Samuel Mawutor, said that the deliberative process of the VPA provides many lessons for the Cocoa Forest Initiative (CFI) to draw on. 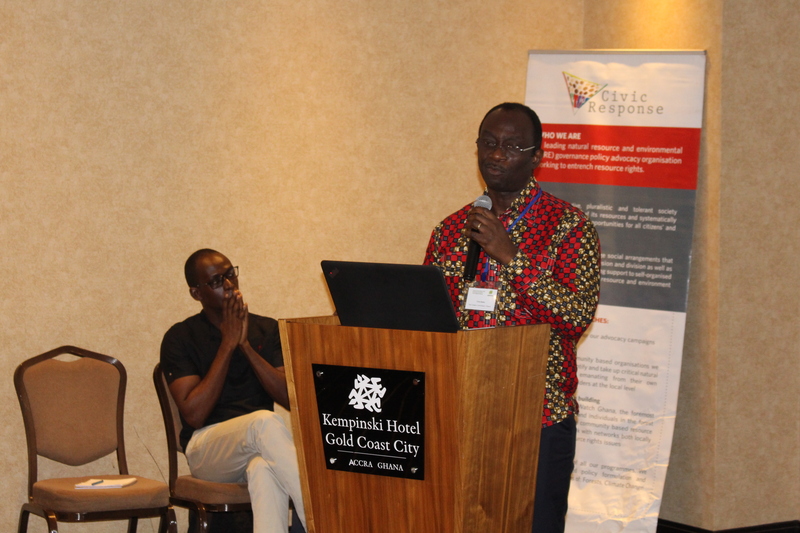 “There are many Civil Society Organisation platforms such as Forest Watch Ghana and Contact Group, the Legal Working Group and other co-ordination points that the CFI could tap into to deepen the process,” he said. A Goldman Environmental Prize winner, Silas Siakor, also shared lessons on how Liberian local communities for the first time were allowed a seat at the table to directly participate in high level processes of forest reform in Liberia. The Side Event was organised by Civic Response together with its partner, Fern, to discuss the lessons learned from the FLEGT VPA processes in the forestry sector which are relevant for the cocoa sector. It also aimed at strengthening civil society participation in the process through the sharing of lessons from how CSOs participate in VPA in Ghana.